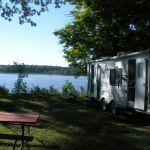 Ask fellow campers about "Pine Lake Resort" and nearby attractions. This was a good park to overnight, however the only had 1 pull thru site that was level & big enough for 40ft MH. Good electric & water service. After we had used dump station owner's son said we owed $10.00 so we paid. $3.oo for AC so site actually cost $33.00. Have 2 port-a-potty & no showers that we saw. Nice sandy beach & boat & raft rental. We camped at Pine Lake Resort in a Motorhome. This is only 8mi from Spartan Chassis in Charlotte MI where we went for a part. No grocery store in Olivet but shopping & Walmart in Charlotte. This is a nice little park for an overnight stay or a few days. We had a waterfront site with excellent views. It has large spots that are fairly level. They offer boat rental, and have an ice cream bar and a small store.There is an extra three dollar charge if you want to use your A/C. It is not too far off the interstate and is easy to locate. 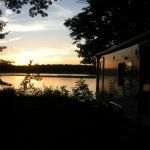 We camped at Pine Lake Resort in a Travel Trailer. Good place to fish and swim. Are you affiliated with Pine Lake Resort ?